Don started to volunteer in 1993 with the Manitoba Golf Association and has just completed his twenty first year as a volunteer. He became a member of the Board of Directors in 1996 and served on the Board until 2007 during which time he was on several committees and eventually became President of Golf Manitoba in 2003 to 2005. Don was involved in the amalgamation of the Manitoba Ladies Golf Association and the Manitoba Golf Association. A lawyer with Investors Group, Don’s legal expertise assisted with the transition to Golf Manitoba. 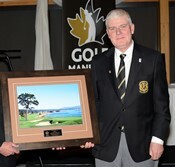 Don was also involved at the Golf Canada level which was formerly the RCGA and the CLGA. He was a member of the Golf United Committee which led to the amalgamation of the 2 groups that now are Golf Canada. Don has been a member of the Board of Director of the Manitoba Golf Scholarship Fund since 2006. He also is the current President of the Manitoba Golf Hall of Fame serving in that role since 2009 and is also a member of the Sport Manitoba Board of Directors since 2013. Don is very passionate about the Rules of Golf. He first became qualified at the national level in 1999 and has maintained that status since 2008. He has worked as a National rules official at two National Men’s amateur events, four National Future Links events, and the Canadian University Championship. He continues to officiate throughout the summer at Golf Manitoba events. Along with his fellow Rules Officials, Don assists in instructing the Level 3 Rules Education seminar and he plays a significant role in the succession plan for Rules officials in Manitoba. He also gives of his time through the winter months assisting with the delivery of the Winter Rules Education Sessions. Don gives so freely of his time and expertise at the club level. He is a long time member and Past President of the Rossmere Country Club. He is also a member at the St Charles Country Club where he is involved at the committee level. Don’s volunteer services do not end with golf. He has been a Board member at Cancer Care Manitoba since 2003 to the present time and acted as the Chairperson of the Board from 2006 – 2009.